You’re in for a treat today… literally. 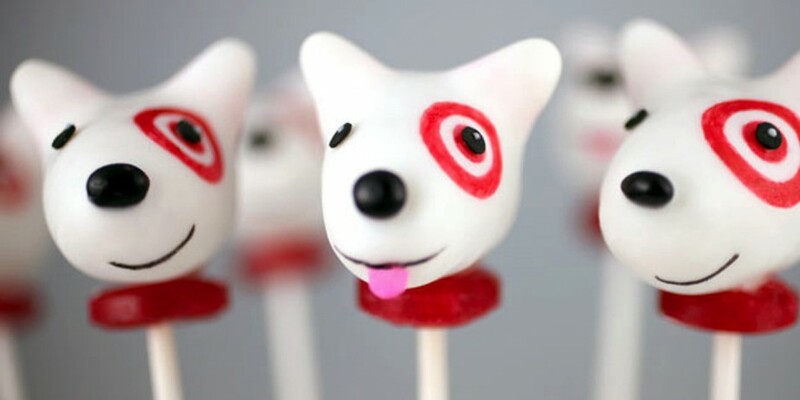 Our friend, baker-blogger Bakerella (aka Angie Dudley), gave Target mascot Bullseye the cake pop treatment for us. The cake pops are almost as sweet as Angie herself. If you’ve never heard of the Atlanta-based baker’s cake pops, they are cuter versions of a cupcake – a mixture of cake and frosting covered in candy coating and placed on lollipop sticks. 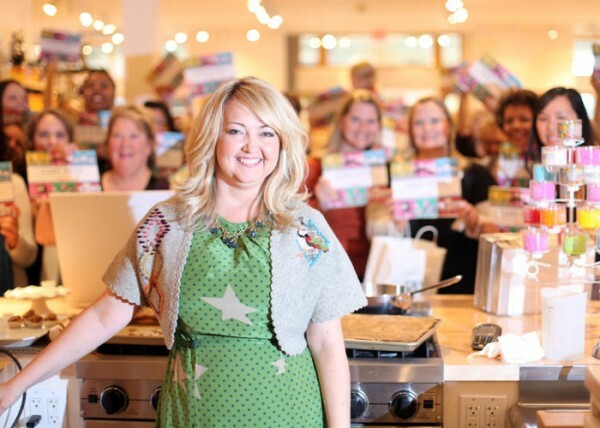 If you have heard of these munchkin munchies, then you’re familiar with her foodie-obsessed, internationally followed baking blog, Bakerella. 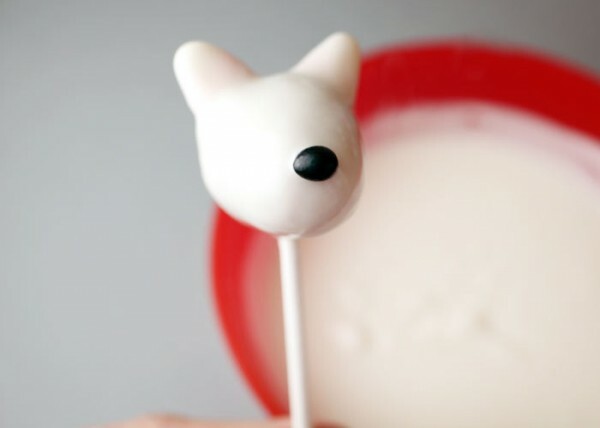 Below, Angie shows us how to recreate her canine cake pop. You’ll have to wait till the end to the see the finished pop! 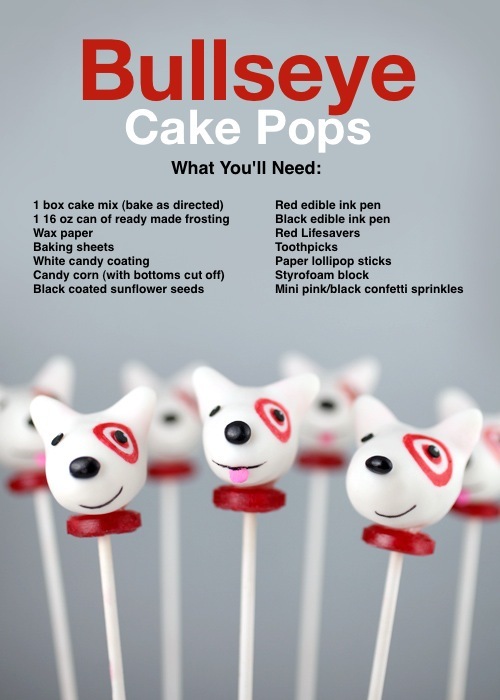 If you’re familiar with my site, you probably already know what cake pops are and how to make them. But if this if your first time seeing some, let me show you how to make your very own out of cake and candy. To make cake pops, you simply start with crumbled cake. Yep, you bake a cake and then tear it up into fine crumbs. It kind of hurts the first time, but once you taste the cake pops, you won’t think twice about messing up a perfectly good cake. Mix the cake crumbs with frosting and roll into balls. You can use any flavor combination you like. 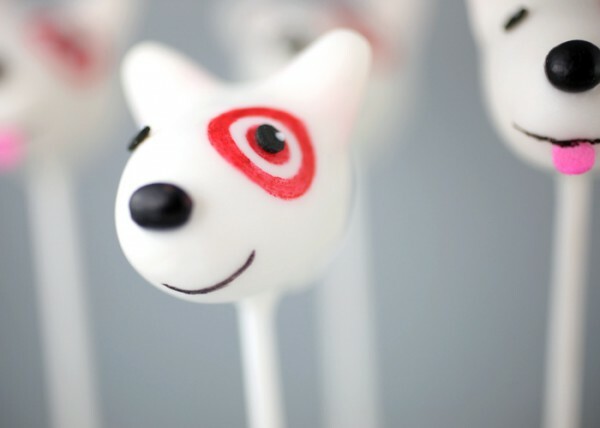 I used white cake for Bullseye since darker cakes can show through light color candy coatings. After you roll all the cake balls, shape them into rounded cones for Bullseye’s head. You can also shape as you go, but I roll them into balls first to make sure I get them all roughly the same size. To make the ears, you just need some candy corn. Cut off the bottom third (the yellow part) and attach the remaining piece to the uncoated, shaped cake balls using some melted candy coating. They’ll look like this. Kind of strange looking for now, but they’ll be super cute pups in a minute. After you dip the cut edge of the candy corn in coating and place on the cake, the coating will dry and act like a glue. 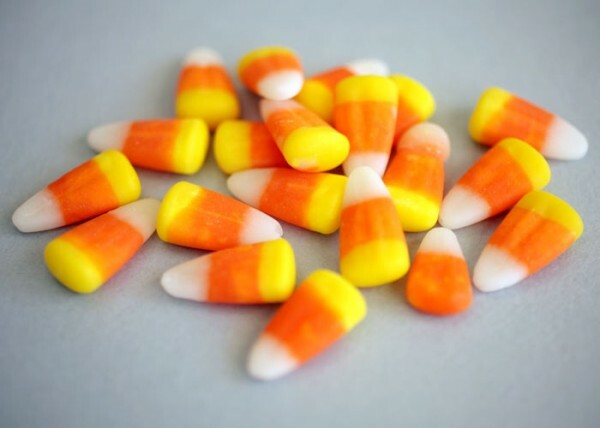 You can cover up the orange section of the candy corn with some of the white melted coating using a toothpick to apply it. If you don’t, you’ll be able to see a hint of the orange once you dip the cake pop. 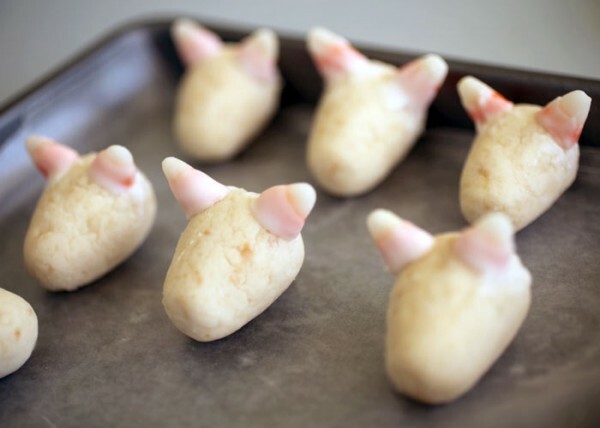 After all the ears are attached, place them in the freezer for about 15 minutes for the shapes to firm up for dipping. If they are at room temperature, they’ll likely fall off the stick. When chilled and firm (not frozen) just dip the entire shape in melted white coating. The fun part. While the coating is still wet, attach a black-coated sunflower seed in position for the nose. You can also insert a miniature pink confetti sprinkle for a tongue to make Bullseye extra adorable. Now that your doggies are dipped, here’s where it all starts to come together. Use a red edible ink pen to draw a bullseye where the left eye should be. You can also pipe on red candy coating. I like the pen because I feel like I have better control. With spots on, finish off the eyes with a black confetti sprinkle and a tiny dot of white candy coating for a twinkle in the eyes. Draw a smirky smile with a black edible ink pen. Such a cute little pup pop. 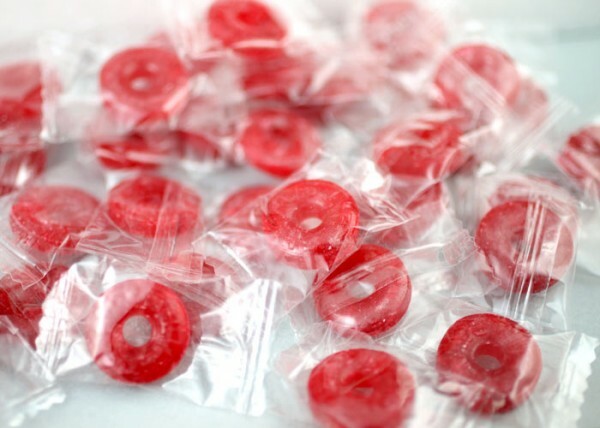 Red Lifesavers. I bet you can guess what these are for. 1. Bake cake as directed on box for a 9 X 13 cake. 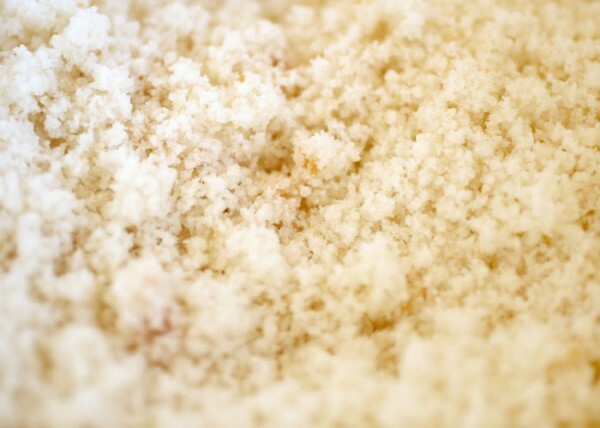 Once cooled completely, finely crumble into a large bowl. 3. 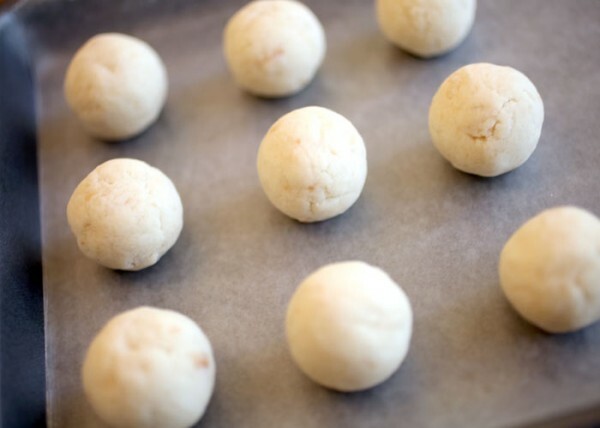 Roll mixture into 1.25 inch balls and place on a wax paper covered baking sheet. 4. 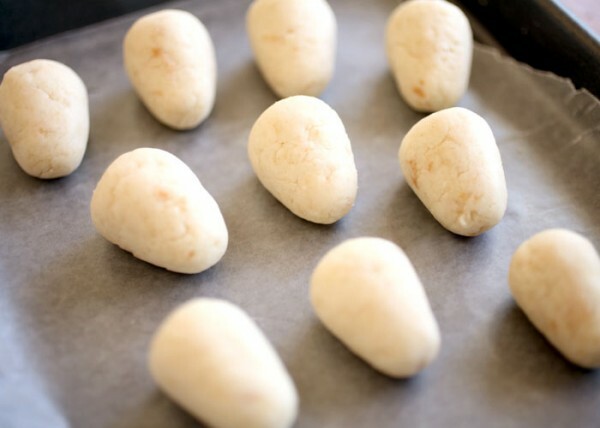 Place cake balls in the freezer for about 15 minutes so they will firm up. After that, you can transfer them to the refrigerator to remain chilled and avoid freezing. 5. When they are firm, form the cake balls into a rounded cone shape. 6. Melt white candy coating in a heatproof plastic bowl so that the coating is at least three to four inches deep for easier dipping. Melt in the microwave in 30-second intervals on low, stirring in between. Repeat until melted and smooth. 7. Dip the cut side of candy corn pieces into the coating and attach to the cone shaped cake ball for Bullseye’s ears. 8. Return shaped cake balls to the refrigerator to remain chilled for dipping. 9. When chilled again, remove a couple of shaped cake balls from the refrigerator at a time to work with. 10. 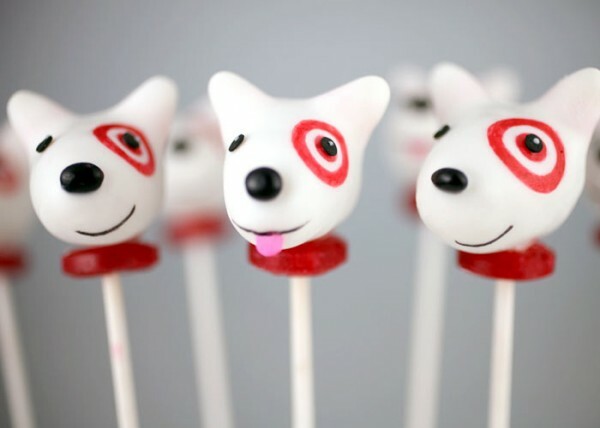 Dip the tip of a lollipop stick into the melted white candy coating and insert stick into the bottom of Bullseye’s head. 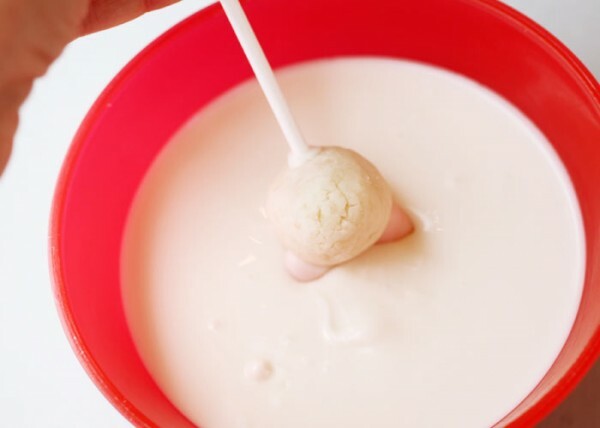 Dip the entire cake pop into the bowl of melted candy coating. Dip and remove in one motion without stirring. Make sure the entire cake ball is covered. If your coating is too thick, you can add a little vegetable oil or shortening to help thin it and make it easier to work with. 11. Remove and allow any excess coating to fall off the pop and back in the bowl. 12. Attach a black-coated sunflower seed in position for the nose before the coating sets. If desired, insert a miniature pink confetti sprinkle in position for a cute little tongue. 13. Place in a Styrofoam block to dry. 14. When dry, draw a bullseye where the left eye should be using a red edible ink pen. You can also pipe it on with red candy coating if desired. 15. Let dry and place miniature black confetti sprinkles in position for the eyes. 16. 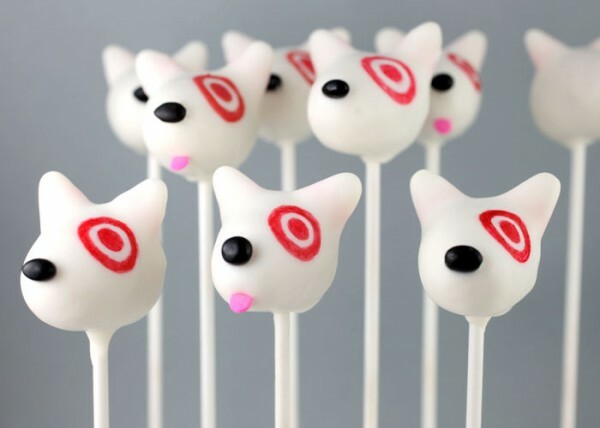 Use a toothpick to dot white candy coating on the black sprinkles to add sparkle to the eyes. 17. Draw on smiles with a black edible ink pen. 18. Attach Lifesaver collars using leftover melted candy coating. 20. Wrap in treat bags tied with a ribbon and store them in an airtight container.